My name is Natalie and I'm 11 years old. I have always loved horses and live on a 10 acre horse farm. Our family has 5 horses, all of different breeds. We have a National Show Horse (Melody), Arabian (Majic), a Paint (Hotshot), a pony (Misty) and another horse that is 1/2 Mustang (Angel). We also have 3 dogs and 2 cats. For fun I collect Breyer Horses, my favorites are the pleasure breeds like Saddlebreds, Arabians and National Show Horses but I have lots of others too. Some of my favorite Breyers are Chubasko and Caravelle, Templado and Huckelberry Bey . I have started getting accessories for my Breyers too and like the sleezys, leg wraps and other items that are like what I use on my real horse. 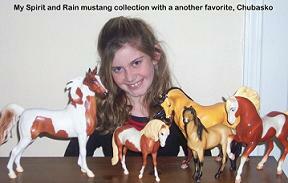 I hope to show my Breyer's next year at our local horse fair that has a Breyer show. 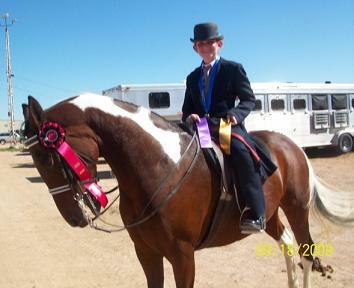 Over the years I have also ridden in horse shows and love to show my National Show Horse (NSH) Melody. She is a beautiful, bay, tobiano pinto. I ride her Saddle Seat which is a more formal form of English riding. Due to a riding accident, this year more than ever I have enjoyed my Breyers. 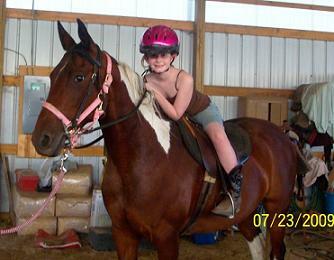 While riding at a 4H practice on May 21st, 2009, I traded horses with another rider. Her horse reared up and over on me and I ended up breaking my lower leg. It was really scary, I ended up with an ambulance ride, a cast up to my thigh and a wheelchair. Later I had to have surgery and a plate put in my leg. 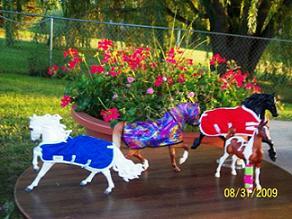 Throughout all the weeks of summer I found playing with my Breyer's was a fun way to still be around horses. This year I didn't get to show my horse at the state fair, but did compete with a team in horse quiz bowl and hippology. While we were there I found a really nice horse barn for my Breyer's, that made it even more fun. I searched on ebay and found lots of horses I liked, but couldn't find one that was like Melody. Finally one night I found a retired Breyer NSH pinto and we bid on it and won!! Around that same time my doctor said I could start walking and even try riding my horse. I had 2 weeks to get back into riding and ready to show. 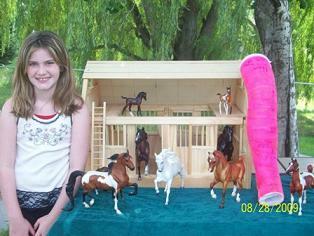 I got my new NSH Breyer the day I got to take Melody to my first horse show since I had broken my leg. In the pictures above are the NSH Breyer,Huckleberry Bey (bay Arabian), Azhar (Chestnut Arabian) ,Goffert (Friesian), Caravelle (pinto Saddlebred), a bay Mustang and Templado (grey Lusitano stallion). Chubasko (pinto Saddlebred) is one of my favorites, but he is not pictured. My horse Melody is a one in a million horse. Knowing she was waiting for me to ride her all those weeks kept me going. The day I finally got to ride her, she was so happy, her ears were up the whole time. She was even careful with me and looked after me. I plan to keep my NSH pinto Breyer forever in honor of Melody because she is such a great horse. She helped me overcome everything, so I could ride and show again. While some collectors keep their Breyer horses in boxes, I love to use mine. I try to be careful with them and still use them as much as I want. September 19th I got to show in another really fun show. It was like I had never broken my leg and Melody was ready too. We were a team again and even got reserve champion in the champion ship class. We got a great ribbon, hot pink and black and hot pink is my favorite color!